Part 6 in a continuing series on Northeast-based gear companies. Based in Yarmouth, Maine, DeLorme produces maps, atlases, and GPS units, among many other excellent and fun geo-reference tools. 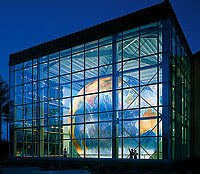 It also boasts the world's largest rotating globe, Eartha, which is open to the public for viewing in Yarmouth. Even if you don't immediately recognize the company name, you likely have seen its series of Atlases & Gazetteers, which are perhaps my favorite collection of maps for the Northeast in one place. Well-thumbed copies of their Massachusetts, Connecticut & Rhode Island, New Hampshire, Vermont, and Maine atlases are front-and-center in my trip planning bookcase. The detailed maps in each atlas cover the entire featured state(s) and feature topography, all major and minor roads, public lands, and a variety of recreational opportunities, among other things. They each run $19.95, though you can buy a complete set for New England or the mid-Atlantic for only $74.95, a savings of $25. DeLorme also produces excellent GPS units: the Earthmate PN-series, which run in the $200-$400 range. DeLorme units feature faster processing speed than other GPS units (notably Garmin and Magellan), which allows them to pinpoint their location quicker and more rapidly scroll around detailed maps. More significantly, you can install a much wider range of maps than are available from either Garmin or Magellan (see my February 26 post for more on Garmin's map options). You can purchase DeLorme's Topo USA software, which covers the entire country at roughly 1:100,000 scale. But more interestingly you can download and install a range of other maps from the DeLorme Map Library. USGS topo maps, NOAA nautical charts, aerial and satellite images...they're all available to install on your GPS unit and have your location pinpointed on them. And for only $29.95 a year you have access to all of them. DeLorme offers a range of other products as well, perhaps most interestingly is their upcoming release of a combination DeLorme GPS unit with a SPOT satellite tracker, which I featured in the most recent (March/April) print edition of AMC Outdoors. Read all about it in the company press release.